Some books leave you with a deep emotional impact, some change you intellectually. But rare are the books which do both, and then they go beyond and leave their readers transformed. Zen and The Art of Motorcycle Maintenance is one such masterpiece. What this book is about is so abstract, and yet so well-defined in its undefinable terms, that it encompasses everything life is about. The protagonist is on a month-long bike trip with his son, Chris, from Minnesota to California. On the way he is delivering a monologue, a Chautauqua. The monologue, along with context of what’s happening in present, is what most of this book is in terms of content. There is hardly any story, but what it presents is far beyond that. The truth knocks on the door and you say, ‘Go away, I’m looking for the truth,’ and so it goes away. Puzzling. But there are human forces stronger than logic. There always have been, and if they become strong enough in their hatred of technology that web can break. The Buddha, the Godhead, resides quiet as comfortably in the circuits of a digital computer or the gears of a cycle transmission as he does at the top of a mountain or in the petals of a flower. The narrative style, given the monologue, is explorative. Just line one would explore ideas in their own mind. And with every page the book keeps getting better and better. By the end of it I could hear my heartbeat, no kidding. It’s nice to start journey’s pleasantly even when you know they won’t end that way. 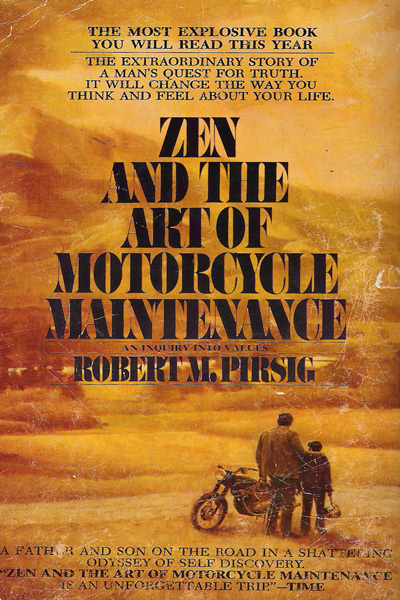 Robert M. Pirsig is not that great a writer, to be honest; much of the book could have been written way better. But he is a brilliant thinker; and what he has to say is far more profound and how he says it is amazing. We have artists with no scientific knowledge and scientists with no artistic knowledge and both with no spiritual sense of gravity at all, and the result is not just bad, it is ghastly. Either you will love it. Or you will not get it at all or disagree with it completely and hate it. Either way, it’s a great book. It’s mind-blowing, it’s an emotional rush and it’s transforming. Soul blowing. … to recognise it by any gesture or action is to give it a reality which it must not have. Published on November 25, 2013. Updated on March 21, 2014.